lisa is cooking: Sara Roahen, What Are You Reading? Sara Roahen, What Are You Reading? In March of 2008, I met Sara Roahen when I attended a class she taught at Central Market cooking school. I brought home a copy of her book, Gumbo Tales, Finding My Place at the New Orleans Table which is a collection of stories that describe that city through its wonderful food and the people who cook it. After that class, I made Sara’s recipe for Shrimp and Okra Gumbo. Sara is on the board of the Southern Foodways Alliance and is currently co-editing the SFA Community Cookbook due out in the fall from UGA Press. Her writing has appeared in Tin House, Chile Pepper, Food and Wine, Wine and Spirits, Gourmet, and Oxford American magazines, as well as Best Food Writing 2003 , Cornbread Nation 2: The United States of Barbecue , and Food and Booze: A Tin House Literary Feast . I asked Sara, what are you reading? 1. 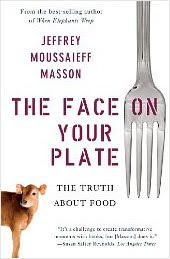 The Face On Your Plate: The Truth About Food , by Jeffrey Moussaieff Masson. This book is trying to turn me vegan, and it has come shockingly close to succeeding. Okay, that's an overstatement, but I am looking at the faces on my plates somehow differently, with more empathy, than I have in the past because of this book--and I've spent a lot of time in the past looking at and pondering and coming to terms with the faces on my plates. The author doesn't even eat honey. I think it's his writing calm that's working on me. He's logical in his radicalism. I haven't been able to eat a hunk of animal flesh with pleasure since picking the book up. Somehow sausage and bacon, as always, get a pass. 2. Madhur Jaffrey's An Invitation to Indian Cooking , because there are so many fantastic vegetarian recipes in there that suit my current mood. Also, I appreciate to the tips of my toes how well her recipes work. While I love cooking Indian food, I have no intuition for it. I need recipes. Thank you for participating, Sara! Check back to see who answers the question next time and what other books are recommended. That Madhur Jaffrey book is great one. I bought it for my husband's mother and she loves it. Interesting books. Thanks for sharing. The Madhur Jaffrey book is indeed a grand one!